The Renaissance Period in music is generally agreed upon to have lasted from 1430 to 1600. It was primarily characterized as a “rebirth” because of a renewed interest in Ancient Greek philosophy and ideals. Moreover, music became seen as an extension of rhetoric as opposed to just a science. Two of the most influential composers of the early Renaissance were Guillaume Du Fay (c. 1397-1474) and John Dunstable (1390-1453). In the mid 15th century, it became increasingly popular among composers to set the text from the Mass ordinary to music, and so many composers wrote their own masses. Many of these masses included a cantus firmus (a pre-existing melody from secular music or plainchant) sung by the tenor singer. Composers also started writing for four voices instead of just two or three. Here’s an example of a 4-part mass by Johannes Ockeghem (c. 1410-1497), one of the most ingenious composers of his day. At the beginning of the 16th century, Josquin des Prez (c. 1450-1521) became “the Beethoven of his day,” as he was incredibly famous, even after his death. Josquin took advantage of a new invention called the printing press, which allowed him to have his music printed and sold, which was extremely novel at the time. Renaissance music theorists called Josquin’s style as the ars perfecta (the perfect art). Here’s a catchy little song of his called El Grillo (the cricket). The lute became the most popular instrument of the Renaissance since polyphonic masses and motets could be arranged for it, and much of the lute music composed and printed in Italy was similar in texture to these compositions. Here’s a polyphonic lute song by the Italian composer Francesco da Milano (1497-1543). The next composer to reach the same heights as Josquin was Giovanni Pierluigi da Palestrina (c. 1525-1594). Palestrina was employed by the church during the counter-reformation, which led to Palestrina changing his composition style so that the text would be easier to understand. In all of Western musical history, Palestrina is the earliest composer whose works have an unbroken tradition in performance from his time to ours. Moreover, a lot of music composition guides were based on his work for centuries to follow. The following piece of his was written in honor of Pope Marcellus. Outside of Italy, the Protestant Reformation resulted in new genres of sacred music across the continent. In Germany, composers took secular tunes and set them the sacred texts in German. Martin Luther (1483-1546) advocated this use of secular music, stating “why should the Devil have all the good tunes?”. The madrigal gave composers a license to break the rules of composing established by Renaissance music theorists because they believed that using previously forbidden harmonies helped to serve the meaning of the text better. Claudio Monteverdi (1567-1643) would end up becoming the composer that bridged the late Renaissance to the Early Baroque. His madrigals pushed the boundaries for their day. Monteverdi’s madrigal Cruda Amarilli was singled out for its dissonances, though they are barely noticeable to the modern listener. 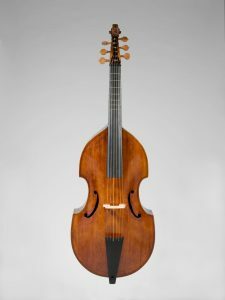 VIOL: Not a single instrument, but actually a family of instruments that were all played with a bow and all held upright, on the player’s lap or between their legs. Viols came in many different sizes to accommodate different pitch ranges. 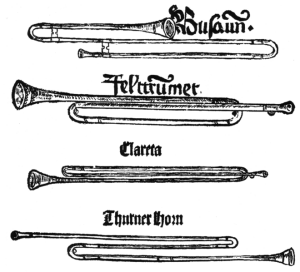 CRUMHORN: Another family of double reeded instruments with curved pipes. They are known for producing a distinct, buzz-like sound. 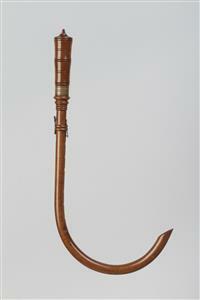 SACKBUT: A precursor of the modern trombone. 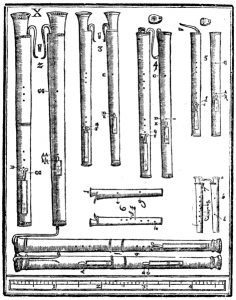 Dulcian: A precursor of the bassoon. 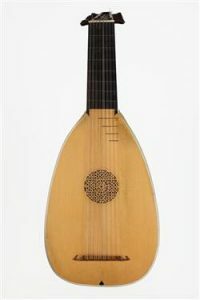 The dulcian was one of the most versatile instruments of the Late Renaissance because it could be played both loudly and softly, and its expressive tone. CORNETTO: A wind instrument made of wood and usually covered in leather. This instrument sounded similar to a trumpet. LUTE: A family of plucked stringed instruments, with rounded backs and strings tuned in courses. The lute was the most popular instrument of the Renaissance and the majority of instrumental music of the era was written for lute.